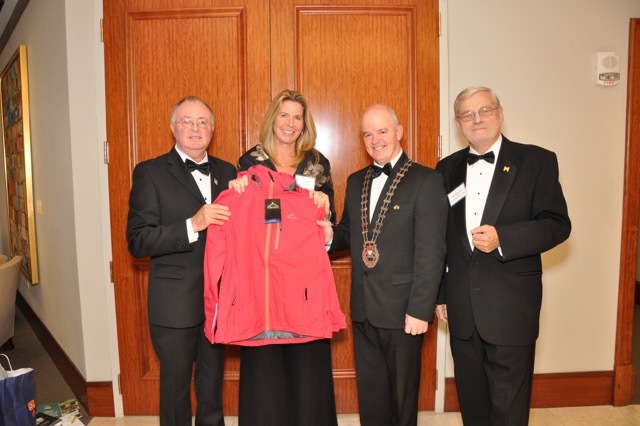 Left to Right; Michael Larkin, Ms. Julie Boland, Mayo Society of Greater Cleveland Person of the Year, Councillor Blackie Gavin, Cathaoirleach of Mayo Co. Council & Gerry Quinn, President of the Mayo Society of Greater Cleveland. (Pic. courtesy Mayo Soc. of G. Cleveland). Ms. Julie Boland, Vice Chair & U.S. Mid - West Managing Director of Ernest & Young LLC, was presented with the award of Mayo Person of the Year at the Mayo Society of Greater Cleveland Ball recently. Ms. Boland was delighted to accept a special congratulatory message and Portwest rain jacket from Michael Larkin, on behalf of Mr. Harry Hughes, Chief Executive Officer of Portwest & Irish Ernest & Young Entrepreneur of the Year.